When it comes to taking care of your car it is important to pay attention to any and all signs of car trouble, which can show themselves in a number of different ways. While some signs of an automotive issue are much more obvious than others, such as a check engine light, decreased performance or a visible leak of some sort, a smell can also indicate that it's time to visit the shop. Anytime you notice odd odors you will want to let a technician take a closer look, to ensure your vehicle is not facing any immediate or future issues. The following are a few problems commonly diagnosed by smell. Can you smell something sweet? Whether you're inside your car or out, a sweet smell may be a sign that your car is suffering from a coolant leak. 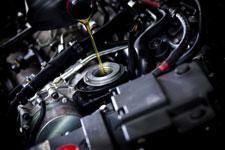 Coolant, which is very sweet smelling and generally bright green in color, is crucial to overall engine health. It is what helps regulate the engine operating temperature to prevent meltdowns. Does it smell like a dirty pair of socks, laundry that needs to be done, or your gym bag in your car? Well if none of those things are actually present, then it could be that mold has begun to grow inside your car's heater or AC vents. If you drive a manual transmission and you catch a whiff of a burning smell as you shift through the gears than it is likely time for clutch service. This smell will be reminiscent of when you were first learning how to drive a stick. You may also encounter this smell if you find yourself frequenting high traffic areas. The foul scent of rotten eggs can indicate that your car's catalytic converter isn't appropriately processing hydrogen sulfide in the exhaust. It is important to visit a mechanic as soon as possible for the health of you and your car. Smells can be very telltale of trouble onboard. If you suspect that your car is having trouble due to an odor you caught be sure to head to Freeport Automotive for professional auto repair in Sacramento. Our team of expert auto repair technicians will quickly diagnose the smell and get whatever issue is causing it fixed. To learn more about our services, or to request an appointment for quality auto repair in Sacramento, call our team at (916) 389-2405 today.